Calallen Volleyball 3rd Place Champs-Corpus Christi Volleyball Tournament. 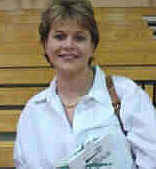 Junior Varsity Head Coach: Sherry Holladay. The Regional 4A Quarterfinals Champions!! Congratulations Coach, Staff and Fighting Lady Wildcats. The Wildcats beat SA Alamo Heights, 15-4, 15-8!! IN PROGRESS: Email Corrections, Please! 2001 Semifinals NB Canyon 11-6-01.